One of the first white settlers to be given land in Nairobi was Frederick Baker. He was granted 1,600 acres in Muthaiga by John Ainsworth, the Sub-Commissioner, on condition that he supplied Nairobi with dairy products. Who was Baker and why had he come to East Africa? He was not a young man, having been born in in Bunbury, Cheshire, in December 1849 to Thomas Baker, a draper and grocer, and Eliza Sandbach, and he arrived in Nairobi in 1901 with his second (or, possibly, third) wife Marie Vera, usually known as Queenie. This lady may have been born in 1856, the daughter of George Salmon, a master butcher in Stoke on Trent, but that person is supposed to have died in 1897 and before that was known as Mary Maria. 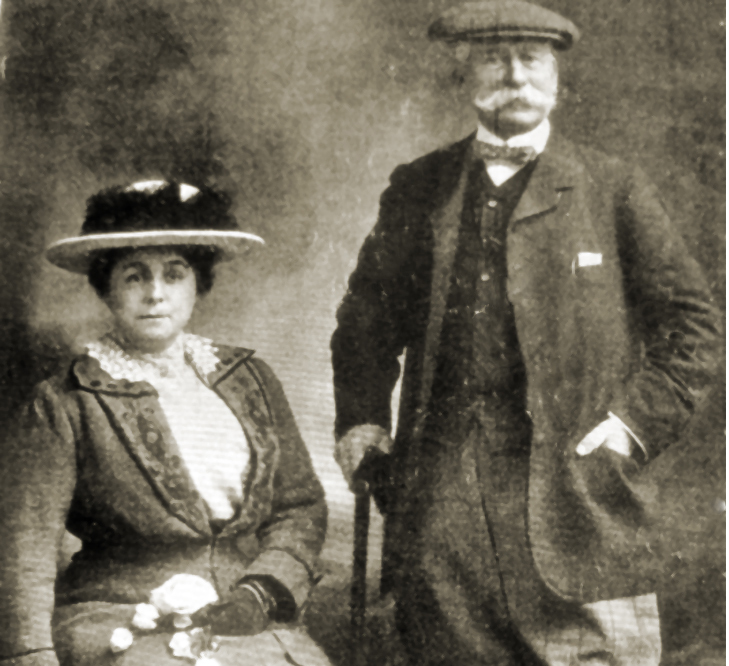 The wife who accompanied Frederick to East Africa in 1901 was Maria Vera and claimed she was twenty years younger than her husband, whereas if she had been born in 1856 she would have been only six years younger. 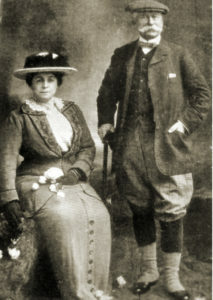 It is possible that she was indeed Maria Salmon and added Vera to her name, and lied about her age to her new husband. Frederick’s first wife Alice Oliver had died in September 1887 and he had married Mary Maria Salmon in 1888. He had been a cotton cloth agent in Stretford, Lancashire (some said he went bankrupt). He took to East Africa with him his wife and his son Guy, a former shipping clerk (born in Holmes Chapel, Cheshire, to his first wife Alice Oliver in October 1882). Marie was the driving force in the dairy enterprise, which she ran with modern equipment, and she won many prizes in local shows. Her butter, known as ‘siagi ya queenie,’ was much preferred to that imported from India in tins. She became the main supplier of dairy products throughout the Protectorate. According to court records, she also appears to have been a regular litigant – presumably she was suing those who had not paid their bills. Sir Frederick Jackson, in his Early Days in East Africa, described Queenie as ‘a lady who merited the highest respect and admiration for her undoubted pluck and determination to succeed in her venture.’ On the other hand McGregor Ross described her as ‘the dreadfullest shrew you ever dreamed of’ (Rhodes House, McGregor Ross Papers). In 1903 Queenie found she could not manage 1600 acres and leased 500 of them to other settlers, including James Archibald Morrison, a retired captain of the Grenadier Guards. Her husband joined the Nairobi Section (Mounted) of the Volunteer Reserve in1904. Queenie sold all her property, known as ‘Homestead Farm’, to Archie Morrison in 1912 for £20 an acre, possibly because her older husband (he was then 71 years of age) was not well, and the pair retired to England, leaving behind her husband’s son Guy. J.C. Coverdale carried out the title survey for Morrison and discovered that the land covered 754 acres. Morrison transformed the dairy establishment to a residential estate with small plots, devised by the firm of architects Henderson and Ward. He also built Muthaiga Club on the site. Muthaiga became a township, but in 1928 it was absorbed into Nairobi Municipality. The name ‘Muthaiga’ refers to the tree whose bark is used by the Kikuyu people for medicine. Gertrude’s Garden Children’s Hospital was later built on the site of the Sandbach Bakers’ house. The Sandbach Bakers left Mombasa on the Windhoek in August 1912 and arrived in England on the 28th of that month. In England they were interviewed by a reporter from The African World (31 October 1913). Frederick told him that before he went to East Africa he had been a member of the Manchester Chamber of Commerce, of the Royal Exchange, the National Liberal Club and the Manchester Reform Club. He said they planned to grow cotton when they went to East Africa, but were dissuaded from this. The reporter described the appearance of Queenie as ‘more fitted for the polite occupations of the drawing room than wrenching into commercial order and success the untamed forces of the jungle and the plains.’ But a few minutes’ conversation led to him say, ’One might as well doubt the traditions of Boadicea or of Joan of Arc as pretend to mistake the qualifications of Mrs Sandbach Baker as a colonial pioneer.’ As for Frederick, he was described as ‘happy in the assurances of the correctness of his conclusions.’ Apparently he had sent the first samples of Ugandan cotton to England in 1902 and claimed that with Lord Emmott he was the means of launching the cotton-growing industry in Uganda. The reporter interviewed the couple in the Westminster Palace Hotel and said they were planning to leave England to embark on an important project. There is no record that they returned to Kenya. It is possible that they went to India because it was in India that their son Guy married Nora Meade King, on 13 December 1921. Guy remained in Kenya, having been appointed assistant conservator of forests in 1902, in charge of forests in Kikuyu and near Nairobi. He was later involved in the sawmills business and later still farmed at Marmanet Falls, Thomson’s Falls (Nyahururu). He was responsible for starting the Nyeri golf course, with Reggie McClure, in 1910. Both his wife, who died on 4 June 1930, and he are buried in Forest Road cemetery, Nairobi. Guy’s date of death was 27 July 1956. It is not known when or where the dairy pioneers, Frederick and Maria, died, but they do not feature in Kenya records after 1912.